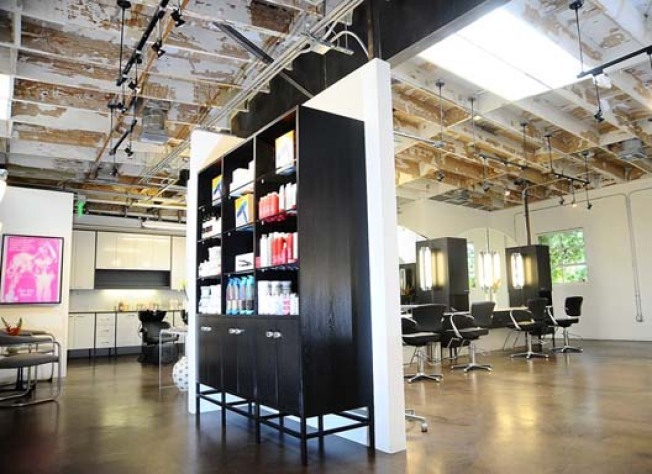 LA designer Jenni Kayne just got a new neighbor to her West Hollywood boutique, namely, her hairstylist Leanne Citrone, who's set up shop with fellow cutter Andy Lecompte at new Andy Lecompte Salon. WWD reports, over the course of 11 years, the hair vets have worked together at salons such as Privé and Chris McMillan for Art Mix. The 2,500-square-foot space, designed by Johnna McHugh and Janet Perkins, reflects each partner's aethetic: "Citrone is a big fan of white, so there’s white tufted leather on the front desk and white paint covering the walls and wood ceilings. Lecompte favors black, the color of the cabinets and hanging lights." History of the space can be seen in purposefully left cracks and lines "that run along the brown cement floors and that fracture the windows." Art from "Paul Rusconi, Robert Rauschenberg, Marilyn Minter and Andy Warhol—fosters a modern, loft-like feel." As for services, cuts range from $200-$500, color from $125-$400. And as for service: "The front desk employee greets clients by name, and coffee and fresh water is brought out to them on trays."